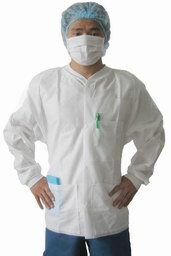 SMS Lab Coat: SMS fabric provides an optimal mix of protection and comfort. White knit cuffs keep your sleeves from riding up. 1 chest pocket; 2 side pockets; 5 button snaps front. 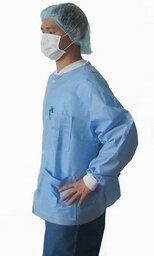 SPP, Dark Blue Lab Coat, 50grm, polypropylene lab coats offer light fluid protection from sprays or mists, as well as dust and dirt. Features snap front, with white knit collar and cuffs. or closure with elastic wrists and self-material collar. Blue, Green, White,Dark Blue, Red,purple etc.